Too soon to lose weight? Whether you're planning on losing the "baby weight", restarting a diet stared before pregnancy, or simply looking to get slimmer post-partum, it is important to make sure it is safe for you to do it. Everyone is different, every birth and post-partum experience is different, so naturally not everyone will look at weight loss the same way either. Or even care at all - I certainly didn't after my first 3 babies. Most people would recommend that you have been checked out by your doctor before you start any weight loss after having a baby. Here in the UK that would be the 6-8 week check with your GP. If you are planning to diet you really must discuss it with your doctor first. The same applies to exercise, discuss with your doctor what is safe to do given your own situation. For example, someone who had a c-section will have very different needs and abilities early on than someone who didn't, and someone who has suffered anaemia or gestational diabetes will need different dietary needs that someone who didn't. If you are breastfeeding then you can - in most cases - still lose weight without it affecting your milk supply, so long as you are sensible. A slow and steady weight loss such as 1-2lb a week should not affect your supply if you are continuing to eat healthy foods such as fruit and vegetables, and drinking plenty of water. Your doctor will possibly recommend vitamin supplements such as calcium. Bare in mind that you can be entitled to around 350-500 extra calories a day when you are breastfeeding, greater end of he scale for exclusive breastfeeding, and lower for mix feeding and weening babies. In any situation the recommended weight loss for safe and healthy loss that it more likely to stay off is 1-2lb a week. 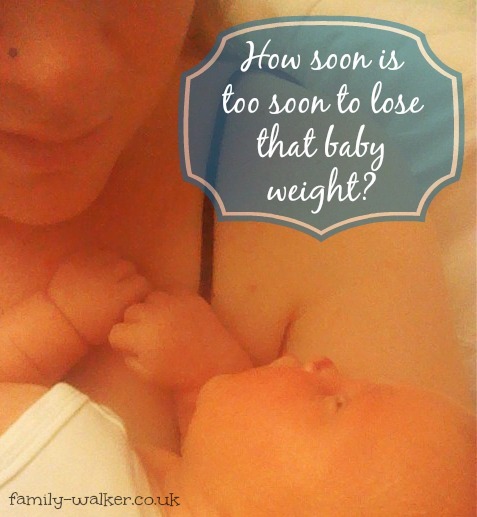 Losing baby weight is no different. You might want to be in a rush to drop the weight or a dress size but it's not worth it in the long run. A new baby in the house will take a lot of energy and mess with your routine, and trying to lose more than that is just added pressure you don't need. You also run the risk of making yourself feel faint or ill. The saying goes "9 months on and 9 months off", this is a good guide line.